Visual Studio 2017 15.7 Preview 4 is now available and we have added a few more CMake features in addition to the Targets View and single file compilation added in Preview 3. We keep the version of CMake that ships with Visual Studio as fresh as possible, so we have updated it to version 3.11. We are also excited to announce that CMake projects now support the IDE’s code analysis features that previously required a VCXProj to take advantage of. 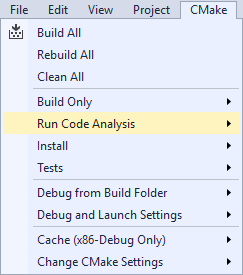 In the latest preview, you can now run Visual Studio’s comprehensive code analysis tools on CMake projects. Currently, you can run code analysis at the target level. 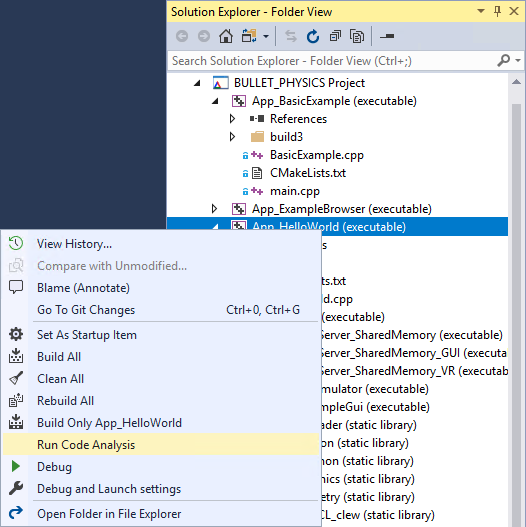 Options to run code analysis for single files or your entire project are coming soon. By default CMake projects use the “Microsoft Native Recommended Rules” rule set, but you can change this by modifying your CMakeSettings.json file. Just add the “codeAnalysisRuleset” tag to your configuration with the name or path to a rule set file. To ensure that your projects can take advantage of the latest and greatest CMake features we have upgraded the version of CMake that ships with Visual Studio from 3.10 to 3.11. You can find the full lists of enhancements to CMake 3.11 in the CMake 3.11 release notes.